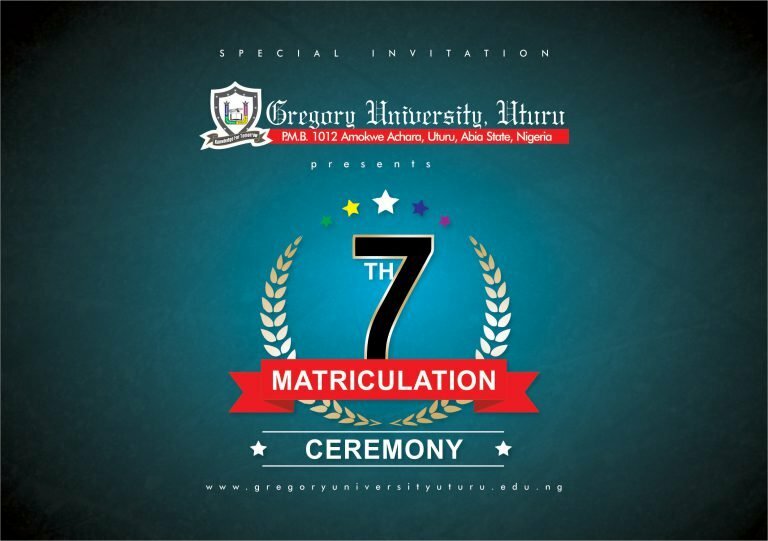 Gregory University, Uturu (GUU) has announced the date, time and venue of its 7th matriculation ceremony for the 2018/2019 academic session newly admitted students. The management of the Gregory University, Uturu (GUU) is set to induct another set of scholars into the university as the institution holds her seventh matriculation ceremony. According to the Head of Media and Public Relations of the University, Mr. Ogbonnaya Ogwo,the event which holds on Saturday, February 2, 2019 at the Goodluck Jonathan Auditorium, Gregory University Uturu by 11:00 am will be used to induct over two hundred freshmen, who hail from different parts of the country and beyond. He added that a colourful night of artistic presentations aimed at motivating and inspiring the freshmen to strive for all round excellence has been planned to precede the event. An invitation signed by the Deputy Vice Chancellor and Chairman Ceremonials Committee, Professor Evaristus Anyaehie on behalf of the Chancellor, Board of Trustee, Governing Council, Senate and Congregation therefore invites parents,guardians,well wishers and the public to this annual and epoch event.